December is filled with holiday parties, dinners, and events. We love seeing so many of our friends, family members, and celebrating the joyous season. Of course, we enjoy the tasty food as well. 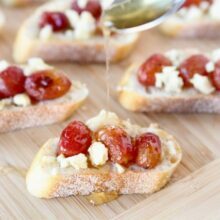 One of my favorite holiday appetizers to serve and eat is cranberry orange brie crostini. If you are looking for a new holiday appetizer to serve this year, you must try this crostini recipe. It is delicious, easy to make, and pretty to serve. All you have to do is spread orange marmalade on baguette slices, top with brie, and pop them in the oven until the cheese is melted. 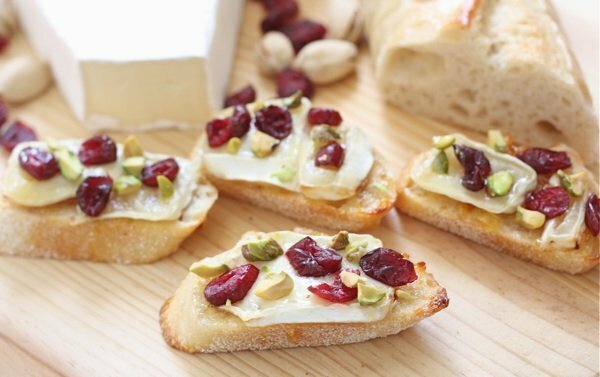 I could eat a whole plate of melted brie on bread, but to spice things up for the holidays I add dried cranberries and pistachios on top of each baguette slice. It’s that easy! Make this festive cranberry orange brie crostini for all of your holiday parties. It is sure to be a hit and doesn’t require a lot of work-my favorite kind of recipe. 2. Spread each baguette slice with about 1 tablespoon of orange marmalade. Next, add a piece of brie to each slice. Place baguette slices face side up on a large baking sheet. Bake for 4-5 minutes, or until the brie is melted. Remove from oven. 3. 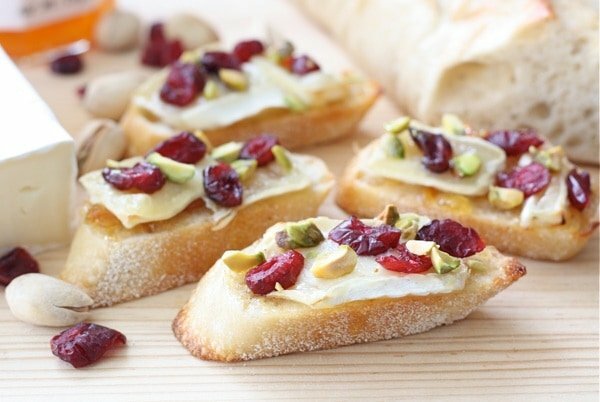 Top cheesy baguette slices with a few dried cranberries and sprinkle with chopped pistachios. Serve warm. This combination sounds fabulous. I love brie with fruit! I love pairing brie with fruit! Cranberry and orange make it so festive! This sounds amazing! I’m totally trying this recipe this week. These look like the perfect appetizer for this time of the year. And the colors are so festive! It is so wonderful to be involved in this progressive dinner party. Your appetizer looks great! Brie is my favorite cheese! I’m adding this to my appetizer list! Looks so good! Perfect little appetizers! I love brie, and this sounds like a great way to dress it up! i recently discovered a love of brie last year (a little late, i know) and now i can’t get enough! I loooooove brie! Especially served warm. I can just taste these little crostinis already… YUM! Anything with Brie grabs my attention, but I really like the added pop of color and flavor in this appetizer. What a beautiful festive looking appetizer. I might use this at our family’s christmas party! I entertain a lot and I seem to always forget about doing simple (yet incredibly delicious) appetizers like this one. I love that combo and they look beautiful too. Thank you for the mention! Love brie and when combined with these exotic fruits it surely will make a great starter. Lovely click. This looks beautiful – and delicious! This is so festive looking and great combination and presentation! A simple but perfect appetizer for any occassion! holiday colors, french bread and brie – what more could a girl want??? love that combo! This looks so wonderful. This will be on my next party menu! doesn’t brie make everything better??? looks like a winner of a recipe. The flavors on these crostini sound absolutely mouth-watering! This is such a festive recipe :). Love these festive, tasty little treats! I love the name of your blog it really cool. Your food looks very tasty and your pictures are nice. You should post these over at dishfolio.com you would be a great addition. Yum! I love brie, and the orange and cranberry is so perfect for it. What a tasty and elegant appetizer! I will definitely have to keep these in mind for my next dinner party. Thanks for sharing, Maria! Happy holidays to you! Hmm so maybe THIS is why I’ve been harboring a jar of orange marmalade in my cabinet! Sounds delicious! OMG, this looks so delicious! I’d love to serve this at my Christmas party coming up! Love it!!! I am so happy to be part of this very special event. 🙂 Love Brie and this delightful combination you’ve come up with for this crostini! What a festive appetizer with great flavors and textures! the jam in the background is so good!! I use the raspberry jam for raspberry butter. Hey Maria: These look so pretty for the holidays! And I’m sure they’re delicious. Delicious idea… and they’re pretty too! I love the festive look of these little apps! And they sound delicious, too! Thanks for sharing it. It’s great to work with you for Share Our Strength! Wow, the perfect marriage of so many great flavors. I love brie — Saint Andre variety is divine. Also, I LOVE bonne mamman jam. I won’t touch anything else. Gotta love such an easy appetizer! The colors are so pretty too, perfect for a party. What a beautiful, simple appetizer. Thanks for the idea! What a great quick appetizer for a great event. I’m excited to be participating with you. I hope we can inspire many to donate. I would like this for breakfast too. I never get tired of brie cheese. Love the pistachios on this! I can almost taste these just from seeing the beautiful pictures. They not only sound delicious, it’s hard to beat the fruit and cheese combo, but they are so festive looking with the colors from the cranberries and pistachios. Excellent choice for the Share our Holiday Table meal. What a great combination of flavors! 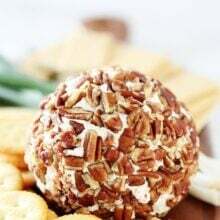 I can just taste the sweetness of the cranberries and the orange marmalade, the saltiness of the pistachios, the creaminess of the brie, and the crunchiness of the bread. For me, I would some of my homemade gluten free french bread. This recipe looks like a winner! Those look so pretty! I’m going to make those for our anual EveEve party. Thanks for the easy recipe. Share Our Strength is a great program. That’s so nice you are helping out. The crostinis sound simply lovely. My husband and I always go back and forth – he prefers his brie chilled, I like mine melted. Great combination of flavors here. gorgeous! i think i’m going to make this for my next holiday get-together! love simpleness. I like how simple it is to prepare! Gorgeous flavours and lovely presentation. Maria your photography is amazing! Can’t wait to see you two at christmas! Thanks Kym! Our kitchen is DONE and waiting for you. Pictures will be on the blog tomorrow. Let us know your schedule. Maybe we can do some baking together! Such a great set of ingredients in this. Yum! Great appetizer for a great cause! So colorful! Perfect for the holiday! Lovely photos. Those look so colorful and delicious. I need some brie and quick! I could eat melted brie on bread any day too 🙂 I love how you’ve spiced it up though. These looks gorgeous and delicious! Thanks for the appetizer idea! A simple perfection. Maybe I’ll squeeze this in my Christmas dinner menu. Thanks! 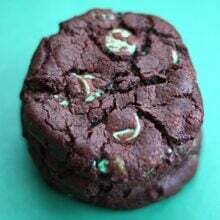 Great mix of tastes here in a simple, perfect bite. Plus it totally matches the holidays. this is a unique batch of crostini! very nice, maria–you’ve taken a classic combination and given it a nice twist. That looks like it came right out of a magazine. Your lighting is beautiful Maria. Love this. Brie with fruit is so good. I love fruit paired with chees. Great recipe, Maria! this looks awesome! i love the cranberry pistachio combo ever since i made cranberry bruschetta. can’t wait to try this sometime soon! This combines some of my favorite things. I could eat those beautiful photos. I’m a sucker for anything cranberry. What a great recipe…love the photos! Anything with brie is great; especially with berries! I knew I had seen brie crostini somewhere recently. Glad I found it! I love brie in and on everything. This is simple and pretty. Definitely making this next week, thanks! What a wonderful blog — fascinating recipes artfully presented. 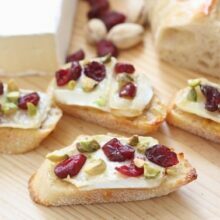 Tried these cranberry/pistachio/brie crostini for both Christmas and New Year’s Eves, HUGE hit. Ran out of marmalade, so substituted fig jam — equally delish! Glad it was a hit. I will have to try fig jam next time! love this appetizer recipe! so festive. Sounds so easy and delicious! My kind of appetizer! 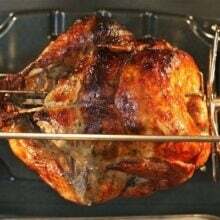 Pingback: what’s cooking at my house | you need an app for that? hotels that ensure luxurious amenities at competitive prices. * Administrator as well as employee login with password protection. Some hotels will organize trekking or cycling expeditions throughout the mountain regions. Made these on Christmas. What a hit! They were so good.